We are your premier support for Tearle family history. We research the lives of individual Tearles and their families, and tell their stories, backed up by a database with over 5500 names. So far we have 213 stories and histories – called “posts” – of interest to those who want to see what happened to families and ordinary men and women who sometimes risked everything to do something new. We also have factual articles on the times and pressures that forced changes to the way our families worked and even where they lived. I have previously told the story of Herbert John Tearle of Bexleyheath (universally known as John) who was wounded in Flanders sufficiently to receive the Silver War Badge, and then went to Malta with the London YMCA branch to look after wounded soldiers. This is the second story of the men who were in Malta. We were contacted by Hazel King to say she knew quite a lot about Herbert John Tearle. It turns out he was quite the businessman and a talented hobby artist. We offered to host her essay, and the result is here, starting with the story of Jabez Tearle of Hockliffe. Many thanks to Hazel, and also to her friend Chris who gallantly typed the handwritten manuscript. Sgt Francis Joseph Tearle, survived flying Bristol Blenheims in the Battle of Britain and was transferred to 1435 flight, in Malta during the WW2 Siege of Malta, flying Bristol Beaufighters. Elaine and I have visited Beaufighters in Scotland, Duxford and the RAF Museum in Hendon. I have written a background story on these magnificent, heavily armed, although largely forgotten, aerial weapons. The story is mostly completed, and will lead on to a major story of the Tearles who worked in Malta – Sgt Tearle was one of three. We are currently working on the background story of Sgt FJ Tearle, a son of Patrick Matthew Tearle and Catherine nee Burns. 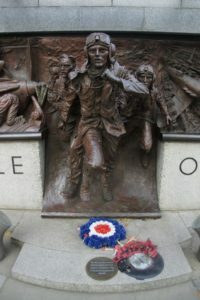 Sgt Tearle is listed on the Battle of Britain memorial outside Westminster Underground Station. He grew up in a very busy and talented family, who lived in Willenhall, Staffs, then Glasgow and finally in Cardiff. I am working my way through quite a large family, some of whom had remarkable lives. I am pleased to be able to document their stories. We are still researching this story, and updating as we go.